The Cambridge History of Britain is an innovative new textbook series covering the whole of British history from c. 330 to the present day. The series is aimed at first-year undergraduates and above and volumes in the series will serve both as indispensable works of synthesis and as original interpretations of Britain's past. 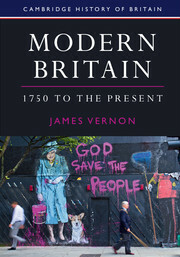 Each volume will integrate political, economic, religious, social, cultural, intellectual and gender history in order to chart the changing shape of Britain as a result of the gradual integration of the four kingdoms and Britain's increasing interaction and exchange with Europe and the wider world. Volume I covers the period from the late Roman Empire to the shift in power and influence from Scandinavia to Normandy in the mid-eleventh century. Volume II charts Britain's transition from the impact of the Viking and Norman Conquests to the eve of the Reformation. Volume III traces the four nations' development from the Wars of the Roses to the formation of 'Britain' and the aftermath of the Acts of Union, while Volume IV examines the period from the eighteenth century to the present. The four volumes will combine chronological and thematic approaches to the past and will situate British developments within a European and global context. Each volume will also feature boxes, illustrations, maps, timelines and guides to further reading as well as a companion website with further primary source and illustrative materials.